First you must make a strip of european. To start look at the picture of 4-1. This is the basic 4-1.You will need to make several of these. Next you must connect the pieces you made before. The connecting link is shown in yellow. Finally you will have a strip. 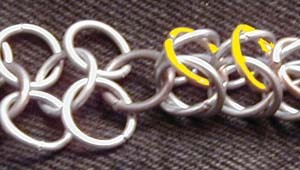 If you are inexperienced in maille i would advise you to make a longer strip than this if you wish to go onto the next step. This is where you turn the box pattern into persian. It is really quite simple, just tuck the edges of the box in. This is now how to make half persian. Its really simple. Just only do one half of the persian weave.